Flashback Saturday: Is New Zealand getting public transport right? Every weekend we dig into the archives. This post, by Peter, was originally published in December 2014. I recently read Paul Mees’ excellent book Transport for Suburbia, which argues that high-quality, useful public transport services can be provided even in the low to medium density cities of Australia and New Zealand. Reader Warren S gave a glowing review of the book earlier this year. Mees, who did his initial research on Auckland in the 1990s, was quite scathing about the decades of planning failures that led to the city having an underutilised and not especially useful public transport network. The user experience has suffered, he argued, due both to decades of underinvestment and a refusal to plan an integrated bus network that would be useful throughout the growing city. The key to any good public transport network, Mees argued, is that it must function as a network. A 2010 NZTA research report (pdf) that he co-authored identified two key principles of network structure. First, the network should be stable throughout the day, as shown on the right hand side of the diagram. In other words, the bus lines that are running in the peak should be running in the middle of the day, in evenings, and on weekends. This has important benefits for users, because it gives them a lot of certainty. For example, a working mother who rides the bus to work doesn’t have to worry that she won’t be able to make it home in the middle of the day in case of a medical emergency. The bus will always be running down the same streets. Second, frequent connective services are essential if public transport is going to serve a diverse range of trips. As Jarrett Walker says, frequency is freedom: when you know that you’ll never have to wait long for a bus (or to transfer between services), then it’s really convenient to choose to take the bus. 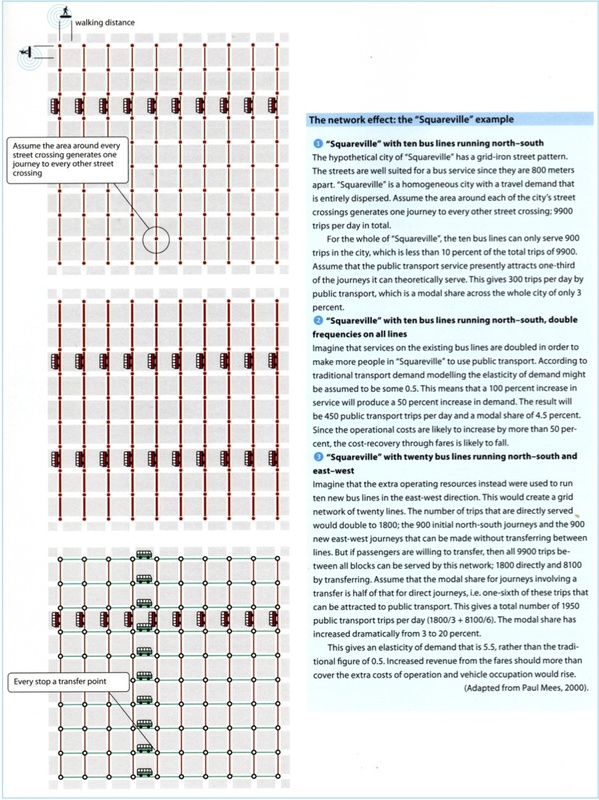 The following diagram is somewhat difficult to read at first, but it depicts how much more mobility is enabled by a frequent connective network. This is really, really good for users, because it gives them many more choices about where to travel and how to get there. Based on the best practice from overseas, Mees argued that New Zealand needed to make some crucial changes in three main areas. As the table below shows, we’re actually well underway (or finished with) most of these changes! Moreover, we’re seeing the benefits of many of these changes already, meaning that they will be easy to build upon and hard to reverse. Of course, we’re not yet in the promised land of PT, and the devil is often in the details. 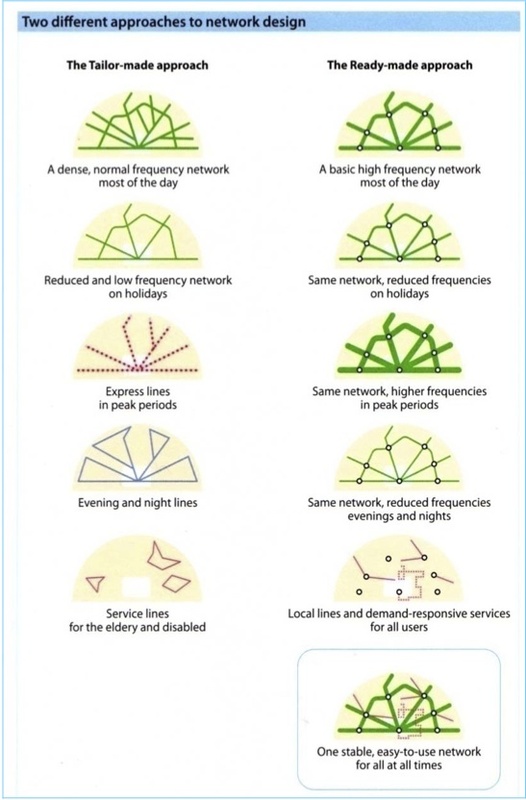 While Auckland’s New Network represents a real improvement in the quality and usefulness of the city’s PT offering, Mees points out that there are many elements of network design that will require fine-tuning. That means things like rolling out bus lanes on more routes, getting bus stops in the right place, and making connection points between frequent routes comfortable and easy to use – all of which requires on-the-ground knowledge. Paul Mees’ recommendation Are we doing it in Auckland? Locate stops in car-free precincts close to important destinations, to give public transport a significant competitive advantage. We haven’t yet started to think about this – perhaps time to get started? Ensure that walking distances between services in interchanges are very short: preferably no more than 10 metres. Create a simple line structure that makes the network easy to understand. Done in New Network – have you seen the maps? Moreover, this is not just an Auckland phenomenon – other New Zealand cities are eagerly embracing the principles of PT network design. Wellington and Dunedin are at work applying the same set of principles to their public transport networks. This week, Christchurch’s own frequent connective network went live – a significant milestone for a city that’s still rebuilding following the earthquakes. In short, there has been a quiet revolution in public transport planning in New Zealand. Many regional transport agencies (and central government) have looked at best practice from overseas and gotten on with implementing it. Paul Mees might have torn his hair out when studying the mess that had been made of PT planning by the 1990s – but things are now turning around. Long may it continue! If Paul Mees has any hair left when you wrote that post, he has none now surely. 3 and a half years on from this post, and we’re still waiting, waiting waiting for the “proper” New Network roll-out to be completed. The electric trains still have the same excessive dwell times and padded timetables as they did in 2014. The only positive thing is that Pt patronage overall hit the 20 million well before the 2020 target set by MoT when Gerry was in power and the CRL “enablement works” have started, even if the main tunnels and other parts, let alone an open CRL are still as far away from now as they were in 2014. Wellingtons GWRC can’t even do a half-arsed Auckland style New Network either nor can they seem to achieve a cohesive anything except cars first and fiddling with the bus service. Even the cycleway in Island Bay has become an national joke. And a case study in how not to do it. Tauranga can’t even rub two bus stops together to solve its “we don’t have Auckland type traffic jams here” in their ever desperate attempts to deal with their increasingly look-a-like Auckland type traffic problems. Christchurch folks are still waiting in vain for a workable bus system, that seems to be in a non recoverable decline still. PT usage there is in a steady year on year decline. Buses are still stuck in traffic with the cars and other SOVs. PT [Bus really] Patronage has yet to recover to pre-quake levels and despite numerous studies into why and how to improve the PT offerings. including offering a rail-based PT option for the far flung areas, the studies [usually managed by NZTA] all said no need for any rail based PT and its all good to carry on as we are building more roads. Meanwhile satellite areas like Kaiapoi and Rolleston and Lincoln nearby keep growing, growing growing, yet the only PT available for these people is still second class at best. So the driving of SOVs continues. 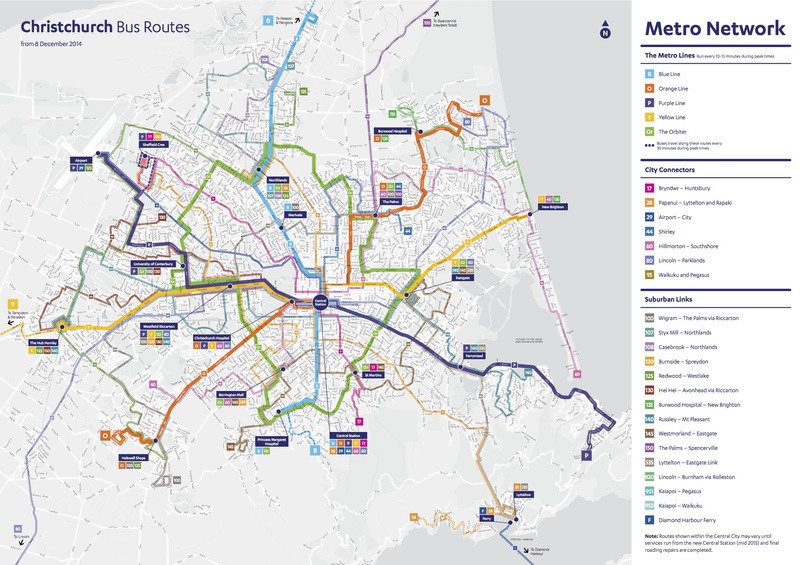 The split between the regional council and Christchurch and other district councils grows ever wider, with basic PT infra like bus lanes, bus stops, waiting areas that are safe and pleasant to use along with where and how often the buses do run, firmly split along 20th century Balkan-style lines with each side blaming the other for problems. And Dunedin? Don’t really know, I hear rumblings of things and like all councils in NZ they are trying to balance a multitude of government imposts they have to pay for and deliver, while trying to be all things to everybody. At least the Otago Regional Council (ORC) has finally acknowledges that Queenstowns traffic problems can only be fixed by a PT system. And so a trial bus system is now in operation. With hopefully improved services coming as patronage ticks up. Still its early days and its about to undergo the first winter of its use down there. If the buses become erratic due to driver sickness or weather issues those people using it in the summer may just give up on it in Winter. All up, no one seems to be really preparing for the day when petrol prices really do seriously rocket upwards like they did more than once n the ’70s and early ’80s. As if those days are passed and will never repeat. Recent price rises in petrol this week or so are just a taste of what can happen. And quickly. How would NZ cope if suddenly every day of every month PT-wise was like March-madness? Not very well is the likely answer. No wonder folks everywhere grow frustrated at the glacial pace of meaningful change. Knowing that our future selves will judge harshly the many squandered opportunities we have had to build a proper PT system for the main cities in NZ over the last while and how little to really show for it we have achieved. Yeah we just had 9 years of the Luddites running the place, but even so we need to pick up the pace, a lot just to stand still compared to, let alone get ahead of, the cities elsewhere we like to compare ourselves with. Absolutely right Heidi and just look at the huge AT surge in road maintenance spending in the last financial year. I asked an OIA question regarding this and I am still trying to work out what the answer means. It sounded fanciful, but when I get a chance I will post regarding it and let others form their view. It just seems to me that Auckland is caught in a circle. We build more roads; people use them as that was the intention; that congests other roads so we spend money on them; the extra traffic means more maintenance so we do that (and in my view that is regardless of whether all of it is necessary); oh and I almost forgot the extra carparks; and as a consequence of all of this spending there is less to spend on public transport; so many claim, “why would we foresake our car?”, although it is unlikely that they would anyway. However through all of this our officials maintain the charade that they are focusing on PT. Really? The government is building light rail. No, they are advancing seed capital and someone else is building it, or not. Unfortunately rather than being the circle of life it seems more like a circle of strangulation. Auckland (and NZ) cannot afford to build enough roads to ease congestion, otherwise we probably would have. So more congestion occurs and is happening currently the city suffers the cost of that. How did much of the rest of the world arrive at the solution of mass transit for moving people around major cities and it has still passed us by? While it acknowledges the role that public transport, cycling and walking can play, and shifting some of the freight mode from road to rail, it calls these ‘minor’. As I see it, the rise in emissions has come about because of the investment in roads and underinvestment in public transport, rail, cycling and walking. Accompanying the rise in emissions has been the rise in DSI, poor urban form, car dependency, social and public ill health, waterway pollution, etc. Reallocation of road space and investment to bring about mode shift is the best approach to reduce emissions in transport, because it reverses ALL these negative trends. Reduction in emissions due to a shift to EV technology is a nice-to-have bonus, but has no co-benefits. It’s a pity the couldn’t have done 10 min frequencies on the frequent routes. 15 is not turn up and go, a timetable is still needed. I wonder how much the efficiencies of not having a timetable would save? Could it pay for itself? I would say it’s unlikely to pay for itself. Going from four vehicles an hour to six an hour all day is close to a 50% increase in operating costs on those routes. It’s not exactly that because typically there are already more buses running at peak that that so you don’t need to buy a bigger fleet, and you don’t need extra depot or overheads. But I’d guestimate around 35% increase in costs, without that much increase in revenue. Still a good idea though. I’d love to see the costing on upgrading a dozen more routes to the frequent network, then making the frequent network every ten minutes from 6am to 9pm. That would give us a world class bus system for far less than the PPP payments on the warkworth motorway, for example. There would have to be savings from not having to stick to a timetable though wouldn’t there? They must spend a lot of time waiting around at the moment. You’d still have a running schedule to keep to even if you didn’t have a public timetable, timing points at each end (and occasionally in between on longer routes) are necessary to avoid bunching. There are alternatives with headway management systems but they would require extra cost to set up. Consider the link buses, they run every 5 to 10 minutes but still have a multitude of timing points. Why do the CityLink buses wait in the right turning lane in Customs St for up to 3 traffic light phases before turning into Queen St? Is this their tactic of not getting ahead of timetable? And while waiting at the first stop up from the corner of Queen and Customs, it seems like 3 or 4 go past in the opposite direction. How come the ones going down Queen St are more numerous? Also I wonder what level of subsidy the busy routes have? If the buses are relatively full can they actually turn a profit? Yes undoubtedly most of the busier routes will be profitable, while the less busy coverage ones will run at a big loss. Overall the network is around 50% recovery. My guess would be that the Northern Express, the Link buses, the isthmus arterials and some of the trunk routes like the 18 and the Botany service would be profitable. A lot of those actually run ten minute headway all day as it is. So if had just been assumed that buses would get the road space we’ve all paid for, instead of private cars clogging it up, we could assume that more routes would be profitable? I’m not sure if we would get the network to be profitable overall, but more profitable at least. The running time of the route (i.e. the speed) and the amount of recovery time you have to schedule in at the timing points (i.e. the reliability) are big factors in that. If you can make your line run faster, it means you deliver the same same service levels and same capacity with less vehicles and drivers. A simple example; if you want to run a bus every fifteen minutes and the route takes an hour to make a round trip (including turning around, timing stops and recovery etc), you need four buses and drivers on the road. Each driver can make a return run in an hour. Same route, same stops, same capacity, same frequency…. but twice as many buses and drivers because half the speed. Conversely… if you could speed up that route so it only takes 40 minutes round trip, those original four buses and drivers could do one and a half runs per hour, which means you’d have a bus every ten minutes. Same buses, same drivers, same route and stops, but 50% better frequency and 1.5 times the capacity. Now on most routes cutting out half the run time is unrealistic no matter what you do. But basically every minute of delay you remove across the network you can run better frequency with more capacity with the same resources (i.e. better service for the same cost, attract more customers), or you can run the same frequency for less resources (i.e. same service for less money, reduced cost per customer). Either of those would help the profitability. Yes, that all makes sense. If AT were committed, there are so many bus routes that could be sped up by reducing private car amenity. Removing the unprofitable, energy-wasting, space-inefficient cars would allow the profitability of the space-efficient, energy-efficient bus routes to speak for itself. AT have committed to implementing every one of the recommendations in the Road Safety Business Review Report, and that this will include slower buses in the new 30 km/hr and 40 km/hr areas, probably lower speeds in the bus/cycle lanes, and presumably more enforcement of bus speeds in the situations where drivers are trying to catch up time. All this is good. However, it means that AT will have to ramp up its bus lane programme just to keep the reliability and speed of the bus routes we have. Profitability of PT should be downplayed as much as possible given that the vast majority of roads are 0% profitable. Once we get full-on vehicle-km tolling, then I’ll be happy to discuss making buses profitable. Doesn’t mean they shouldn’t be economical, if it doesn’t detract from the purpose of the service. 27. High population growth since 2013 has generally increased congestion and reduced travel speeds. While the full effects of the recently opened Waterview Tunnel have yet to be fully understood, early indications are that the tunnel is delivering benefits to congestion at a system-wide level and resulting in more efficient operation of the roading system overall. Nevertheless, ATAP projected a rise in congestion from 2013 to 20268, despite substantial investment. Faster growth is bringing this forward. I cannot find any reference to this in the 2018 Report, but given that no major changes are imminent the above comments are most likely to be still relevant. So yes Pete, PT is improving and the rate of increase in ridership has been about 7% in the last year. It is clearly not enough. Auckland will stumble on, congestion will get worse; detrimental environmental impacts will increase; and the cost of remedying this will be pushed to another generation that has not caused the problem. For some bizarre reason road demand pricing has been pushed out for a decade while politicians tell us we have to address the cost of congestion costs..
Hopefully we will see more improvements than have been foreshadowed and that they will happen soon. “Ensure that walking distances between services in interchanges are very short: preferably no more than 10 metres.” Hmmmm…. Long way to go, AT.